Ask anyone who’s been to Iceland what place on this unique little island you should see on your first visit, and they’re bound to mention the Vatnajökull National Park. Stretching from the Öxarfjörður fjord in the north to Sellandafjall Mountain in the south, this natural wonder possesses the kind of beauty that renders visitors speechless. Vatnajökull National Park is not only home to the largest glacier in Iceland, but in the whole ofEurope.As the most prominent feature of the park,the Vatnajökull Glaciercovers an area of 8,100 km2 and makes for an ideal spot for adventurers, ice cave enthusiast, hikers, and nature lovers of all ages. Besides the breathtaking glacier and spectacular ice caves, the diverse landscape of the Vatnajökull National Park encompasses mountains, valleys, canyons, plateaus, black sand beaches, and active volcanoes. Vatnajökull is also the location of Iceland’s highest peak, Hvannadalshnúkur, as well as the world’s longest sight line. If you’re an outdoor enthusiast and photography buff, one part of the Vatnajökull National Park you definitely don’t want to miss is the scenic Stokksnes peninsula. Stokksnes is located near Höfn, a fishing town where you’ll also find the Park‘s visitor centre. There are few places in the world as postcard-worthy as this one. This gorgeous region is every nature lover’s paradise: it has everything from steep mountain slopes, stunning glacier lagoons, windswept black sand dunes, and other out-of-this-world geographical features that are bound to leave you speechless. Vestrahorn Mountain near Stokksnes is also one of the best locations in Iceland for watching the Northern Lights dance above the magical landscape. The mountain is accessible via an interior dirt road open for four-wheel drive vehicles and hikers. If you want to catch the Northern Lights, the best time to visit is on clear days between October and April. For the ultimate outdoors experience, you should consider renting a camping van and spending the night at the Stokksness’ black sand beach whose unique surface will make you feel like you’re camping on another planet. Keep in mind that Stokksness is located on a property owned by a private landowner, which means you’ll have to pay an entry fee of 800 kroner (around $7) per person – though the spectacular landscape and stunning views are certainly worth the price. Located in the Skaftafell preservation area, one of the most unique-looking parts of the Vatnajökull National Park, the Svartifoss waterfall is something else. The name Svartifoss, meaning “Black Falls”, comes from the black lava columns which surround the waterfall. Molded over thousands of years by different natural elements, these imposing dark formations provide an awe-inspiring contrast to the clear water cascading down from the 20m height. The striking appearance of the columns has served as an inspiration to a number of renowned Icelandic architects, most notably Guðjón Samúelsson whose iconic Hallgrímskirkja church in Reykjavík is a stunning concrete version of the Svartifoss waterfall. A half an hour hike through the gorgeous landscape will lead you from the Skaftafell Visitor Centre to this majestic waterfall. On your way to the Svartifoss, you’ll pass by three other waterfalls, and get a chance to see old turf houses dating back to the Middle Ages. At the Visitor Centre – which is open all year round – you can get detailed information about hiking trails, accommodation, and other recreational facilities in the area. Reaching the top of this 1.875-meter tall mountain peak is, without a doubt, one of the best ways to experience the unique Icelandic landscape. Hrútsfjallstindar is the name given to four formidable peaks located just north of the 1000-year-old Svínafellsjökull Glacier, known for being one of the bluest glaciers in the whole of Iceland. While the Hrútfjallstinda peak is not the highest one in Iceland, embarking on a climbing tour to the top is no easy feat. In order to be eligible for the tour, you need to be over 16 years of age and be both physically and psychologically prepared for this highly demanding experience. The hiking tours are led by experienced guides who will provide all the safety equipment necessary for the 14-16 hour hike. Keep in mind though that rain gear, hiking boots, warm clothing, and food aren’t normally provided by tour organizers, so make sure you come sufficiently prepared. What you get in exchange for the physical effort and mental endurance is a chance to enjoy the impressive views of the Vatnajökull National Park stretching before you in all its glory. For the less active types who want to enjoy the breathtaking landscapes of the Vatnajökull National Park without hiking or climbing for hours, flightseeing company Atlantsflug guided airplane tours over various locations of Vatnajökull. You can take a day tour from Reykjavik and Bakki Airport to Vatnajökull National Park, which includes a trip to the iceberg lagoons Jökulsarlón and Fjallsárlón – both of which are among Iceland’s most popular tourist attractions. Taking a flightseeing tour is a unique chance to get a full view of the massive Skeiðarárjökul glacier and fly over to Grænalón, the largest glacier lake in Iceland. The private plane will also take you to see the Lakagígar volcano craters stretching in a 25km long row. Lakagígar or Laki craters are a part of the large volcanic system located around Grímsvötn volcano which has the highest eruption frequency of all the Icelandic volcanoes. The Laki volcano system is notable for its violent eruption which took place over an eight-month period between June 1783 and February 1784. The volcano spewed around 42 billion tons of lava and created clouds of poisonous gas. The pollution led to the death of over 50% of Iceland’s livestock population, while the resulting famine killed more than 25% of the country’s human population. Are you’re an animal lover who prefers seeing wildlife in its natural habitat rather than locked up in zoo cages? If yes, then you definitely won’t regret visiting the Vatnajökull National Park because this vast wilderness area is home to many unique animal species such as reindeer, the field mouse, mink, the Arctic fox, and the pink-footed geese. For the best chance to spot Icelandic reindeer in the wild, book a hiking tour on Mount Snæfell – the largest freestanding mountain in Iceland outside the glacier regions. Mount Snæfell (literally “Snow Mountain”) is actually an old volcano formed during the last Ice-Age and its commanding height of 1446 meters means that the highest peaks are permanently covered in snow – even in the summertime! Herds of wild reindeer can be usually spotted roaming the deserted areas around Mt. Snæfell during the warmer month of the year. During winter, you may also see them near the main walking path. Keep in mind that the area around Snæfell is very remote, so never go hiking on your own. If you spot wild reindeer, don’t approach the animals or try to feed them. There are only around 3000 wild reindeer in Iceland, so be respectful of the wildlife and enjoy the view from afar. In addition to reindeer, Iceland is also known for the adorable pony-size horses. Despite its tiny size, which is the result of both selective breeding and natural selection, this gorgeous horse breed is rather sturdy and can cover long distances without getting tired. What makes these horses unique besides their resilient built, heavy coats, and easy-going temperament, is the ability to perform five different types of gaits, including the tölt – a distinctly fluid gait that looks like a sped up version of walking. Due to their short height and gentle nature, Icelandic horse can be ridden by anyone and the best place to do it at the Vatnajökull National Park is Glacier Horses farm located in Svinafell. Glacier Horses offers short riding tours in Sel (about 6km east of Skaftafell) and about 50 km west of Jökulsárlón Glacier Lagoon. The tour is suited for both beginners and experienced riders and is definitely one of the most enjoyable ways to explore the diverse landscape of the area including green pastures, black sand formations, flowing creeks, glacier rivers, and unique Icelandic forests. The tours are organized between June and October and the price comes at 9.500 ISK per person for a group of 4-5 people ($90) and 5.000 ISK ($40) for children under 12 years old. Not a fan of planes or horses? How about snowmobiles? At Vatnajökull, you can take a guided snowmobile tour of the glaciers that is sure to give you an adrenaline rush. On the day of the tour, you’ll meet with your English-speaking guide who will take you on a ride across Europe’s largest glacier on a two-person snowmobile. You’ll make your way across the great white vastness of the glacier and get a chance to stand on the 1000-year-old ice cap. The snowmobile tour of the Vatnajökull glacier lasts around 3 hours. Safety equipment (including overalls, boots, balaclava face-mask, and helmet) will be provided and all you need to bring is a valid car driving license – no prior experience of driving a snowmobile is necessary. Keep in mind that the weather in Iceland is notoriously unpredictable, so dress in layers just to be safe. The fun and adventure at Vatnajökull never stop! Sailing on the Jökulsárlón Glacier Lagoon is yet another National Park highlight that you don’t want to miss. The 1.5km long Jökulsárlón Glacier Lagoon started to form at the head of the Breiðamerkurjökull glacier tongue around 1934. In mid-1970s, the lake had grown to 7.9 km2 after the glacier suddenly retreated, and Jökulsárlón is now the deepest natural lake in Iceland with the depth of 284 m.
Owing to its unique beauty, Jökulsárlón has been used as a setting for several Hollywood blockbusters, including James Bond installments A View to a Kill and Die Another Day, Lara Croft: Tomb Raider, and Batman Begins, as well as the popular reality show Amazing Race. You have two options if you want to experience this stunning creation of nature in all its glory: take a 30-40 minute tour on an amphibian boat that will take you between enormous icebergs that have broken off the Vatnajökull glacier or book a 1h tour on the Zodiac inflatable boat for an opportunity to explore parts of the lagoon you would not be able to see any other way. The gigantic Vatnajökull glacier has around 30 outlet glaciers or glacier tongues flowing from the main ice cap and the best way to experience these unique formations is to take a glacier hiking tour. You can take a half-day hiking tour from Skaftafell and get a chance to see the breath-taking Falljökul Glacier (“Falling Glacier”) up close. The tour lasts about 5 hours which means it is best suited for physically active and moderately fit persons. Another option is to take a shorter walking tour that starts at the bottom of the glacier valley and ends at the edge of the Falljökull Glacier. This tour explores the lower part of the glacier which has served as the setting for many popular films and TV shows, including Interstellar and Game of Thrones. For the more experienced hikers and thrill-seekers, there’s also the “Glacier Grand Slam”, a combo day tour which lasts around 8 hours and includes both a boat ride and a glacier hike. The adventure starts on the Fjallsárlón Glacier Lagoon with a ride on the Zodiac boat. The boat will take you to Skaftafell where the guides will meet you at the Glacier Guides Booking Hut. Once everyone gears up, you’ll take a bus to an outlet glacier and join your guide in exploring the stunning ice formations all day long. 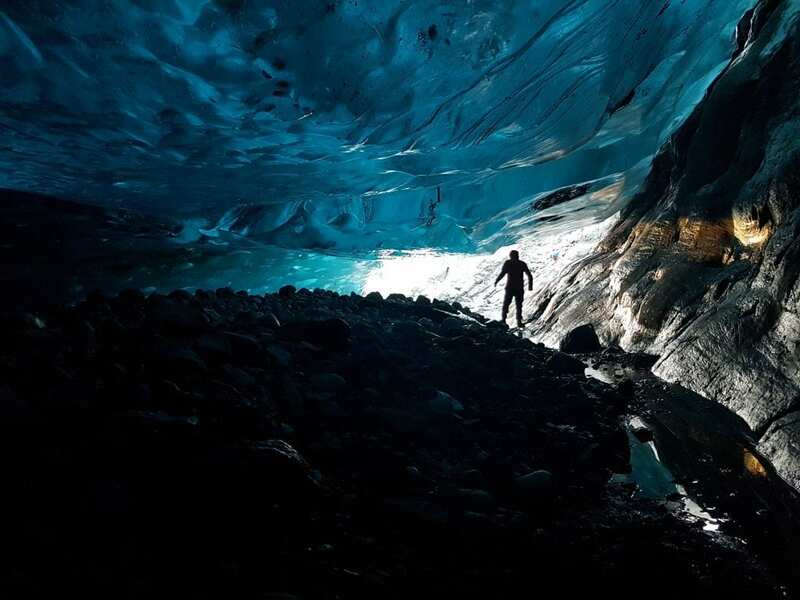 No trip to the Vatnajökull National Park would be complete without experiencing the extraordinary beauty of its ice caves. The beauty of Iceland’s ice caves has to be seen to be believed. Their otherworldly terrain and glorious aquamarine color will leave you lost for words, so if you’re looking for a truly unforgettable experience in Iceland, don’t miss the Vatnajökull ice caves. The Blue Ice Cave tour typically starts at the Jökulsárlón Glacial Lagoon where you’ll meet your guide. After a bumpy 15-minute car ride to the glacier, you’ll take a short hike to the mouth of the ice cave. Now, this is where the real adventure begins. As soon as you enter the ice cave, you will be taken aback by its striking scenery. After you spend a few hours looking at the extraordinary ice sculptures and shades of blue you’ve never experienced before, you’ll walk away with a newfound respect for Mother Nature. No matter what activity or sight you choose to visit at the Vatnajökull National Park, you won’t be disappointed. This astonishing natural wonder will leave you speechless and make you want to keep coming back to magical Iceland.